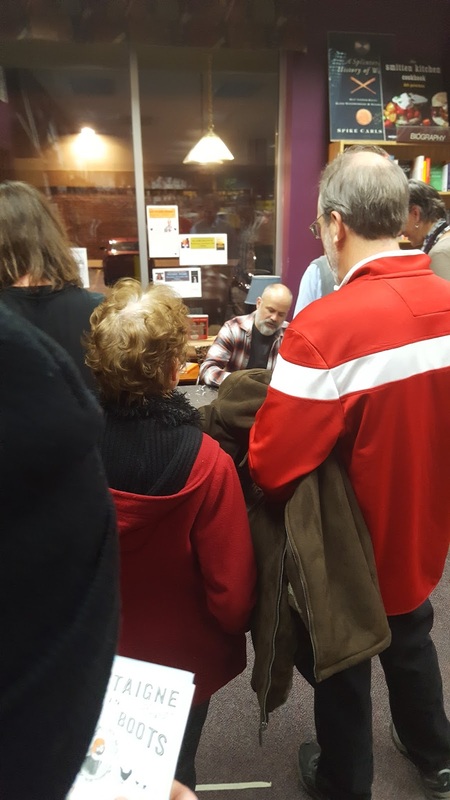 As I sat in a bookstore last night watching Michael Perry, who is arguably my favorite Wisconsin author, I thought to myself, he's where I want to be someday. It may never happen, but even if I continue with what I call my "Sub-Atomic Micro Fame" it is still more than I ever dreamed. I cannot say how excited I am about what the future holds in my writing circles. Much of it is unknown, but I am having a great time at the moment. Having said that, a writing/book update is probably in order, so here goes. Book Release! : January 23rd. The book will be available on Electio's website as well as Amazon, Barnes and Noble and iTunes. Note that if you purchase a paperback on the Electio website, you get the eBook version as well, FREE. Wisconsin Launch: Saturday, February 17th 2018 from 2:30-4:30 at Cafe De Arts Roastery in Waukesha. Minnesota Launch: Saturday, March 10th from 7:00 - 9:00 PM at Subtext Books in downtown Saint Paul. I am also currently looking at dates for a signing at Paperbacks Plus in North Saint Paul as part of their Friday Night Cruisers author events. It's funny how it seems like I just geared down from the Dirty Shirt/Written Life promotion and now am starting all over again. It is a labor of love however and the best part is that I've established many connections, so that part of the job should be much easier the second time around. I am approximately fifty pages into my next book which will be another memoir about my high school days. I attended an all male, military Catholic school which presented enough stories just by that alone. It is bringing back some great memories and some reminders of how stupid high schoolers can be. Additionally, I've been submitting some of the stories from The Portland House to the Saint Paul Almanac, a journal that has been around for a long time. If they are accepted, they will be a good source of exposure to the book in the St. Paul area. The Portland House book trailer continues to progress too. The music portion is nearly completed and then we can layer the voice track over the top of it. Then it's just a matter of doing the video portion - no small feat. I am hoping to muddle my way through that part, but am looking for a good video editor who will work for beer, just in case. And finally, I continue to write poetry when I feel led. It is a great outlet for me and continues to stretch me as a writer. I have a couple of chapbooks out for publication consideration, so we'll see if anything comes of that. Stranger things have happened. So, that's the dream I'm living right now. Pretty lucky and eternally grateful for the support and encouragement from friends, family and my readership. Life is good.